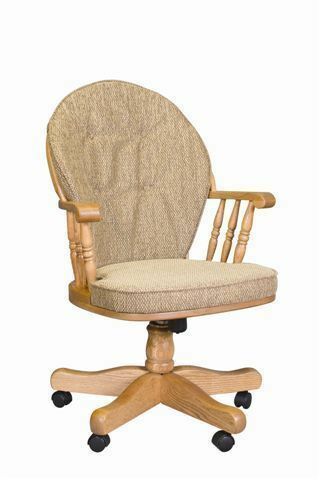 With cushy padding and a stunning solid wood frame, the Amish Heritage Swivel Chair easily performs double duty as a dining chair or office chair. With a five wheel base this chair moves around easily. The back features Windsor style spindles with the popular cage back design that has a steam bent horizontal arm that the spindles are attached to. This chair is available in oak or cherry wood. Comfort and support come along with the Heritage Chair. This chair is custom made to your specifications. Choose wood type, finish color, seat and upholstery. The Heritage makes it easy to move about your desk and computer while you're seated and it also makes for a comfy dining chair as you enjoy a warm breakfast or casual dinner. Want to get an up close look at wood and finish samples before you order? No problem. Order samples to inspect in the natural light in your home. You can order online, or a Furniture Specialist will be happy to help you. We can be reached by email at Questions@DutchCrafters.com or call toll-free 866-272-6773. Thank you for shopping with DutchCrafters.